Nanobots are the next generation of nanomachines with multiple new therapies already received FDA approval for use to treat cancer that rely on nanoparticle delivery vehicles, however, none have used computer programs that control smart nanobots capable of performing targeted drug delivery. Scientists hope that by creating smart nanobots, will enable them to program them to deliver highly toxic medicines directly to cancer tumors without compromising surrounding tissue. Goldstein Research analyst forecast the Nanobots market size is set to reach USD 85 billion by 2024, at a CAGR of 21.5% over the forecast years. The report covers the present ground scenario and the future growth prospects of the Nanobots market for 2016-2024 along with the data of sales of total number of nanobots worldwide. We calculated the market size and revenue share on the basis of revenue generated from major players across the globe. The Nanobots market is forecasted on the basis of revenue analysis, product benchmarking and strategic developments of key market players. The market is forecasted on the basis of number of ongoing clinical trials and investments in nanobots. Based on application, nanomedicine dominated the nanobots market with the market share of 35% in 2016 owing to increasing innovations in the field of cancer treatment related to the specific target. Nanoswimmers and bacteria powered robots are the fastest growing segment attributed to the properties like functionalization of delivering drugs and magnetically controlled nanobots to swim through the bloodstream to target cancer cells. Nanobots Market Outlook 2016-2024, has been prepared based on an in-depth market analysis from industry experts. 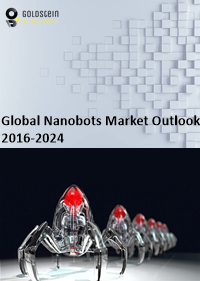 The report covers the competitive landscape and current position of major players in the global Nanobots Market. The report also includes porter’s five force model, SWOT analysis, company profiling, business strategies of market players and their business models. Global Nanobots market report also recognizes value chain analysis to understand the cost differentiation to provide competitive advantage to the existing and new entry players. Our global Nanobots Market report comprises of the following companies as the key players: Xidex Corp., Zymergen Inc., Synthace Limited, Ginkgo Bioworks, Advanced Diamond Technologies and Advanced Nano Products Co Limited. According to the report, major driving factor is the increasing application of Nanobots in healthcare owing to unlimited opportunities helping patients to get treated with safe, reliable technology and advanced healthcare. For instance, nanobots can scan each of the body’s cells for cancerous tendencies, and subject any suspicious cells to careful analysis; if a cancer is detected, they can wipe it out quickly, using more focused and vigorous tactics than the immune system is designed for. Acclimation of nanotechnology among the specialists, surgeons, medical caretakers and other healthcare staff will support the growth of Nanobots market. Further, the report states the biggest challenge is that new medical product is often very expensive when it first goes on the market because the manufacturer’s patents give it a temporary monopoly as it may take a long time for the price of nanomedicine products to decline, due to its complexity and uniqueness. Based on geography, North American market for Nanobots is expected to grow at a CAGR of 11.3% which is expected to reach at USD 70 billion from USD 48 billion in 2016 by the end of the forecasted period followed by Europe owing to awareness of nanobots in surgical care. The market shows steady growth in Middle East and Africa whereas Asia Pacific is expected to be the fastest growing market for nanobots market attributed to increasing investments in R&D by the major players, improvement in healthcare infrastructure and increasing patient base. What is the revenue of Nanobots in 2015-16 and what would be the expected demand over the forecast period?